This was supposed to be the highlight of a lacklustre election campaign. 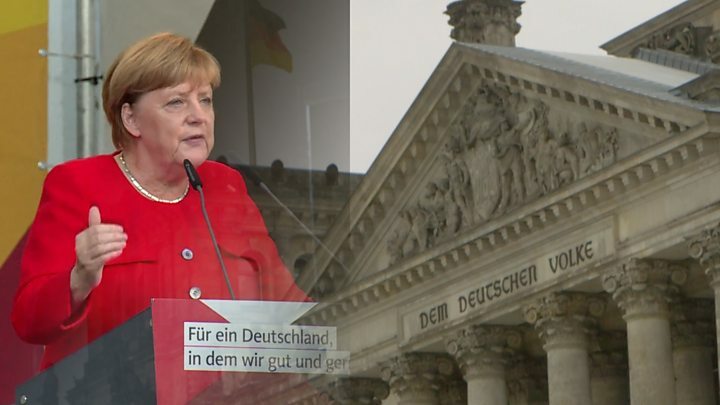 For months German Chancellor Angela Merkel's conservatives have enjoyed a significant lead over their nearest rival - and current coalition partner. The TV stations prepared their viewers for an impassioned, furious debate. But those hoping for rhetorical bloody noses were disappointed. As were the viewers hoping that Martin Schulz, who is unlikely to take Mrs Merkel's crown, might at least taste victory on national TV. Angela Merkel has been in the job for 12 years, and it showed. The chancellor is not known for her skilful oratory and she doesn't relish this kind of public debate. Nevertheless, Mrs Merkel appeared relaxed, credible and experienced, effortlessly parrying her opponent's attacks. It was her best debate performance, according to the German news site Spiegel online. Which doesn't say much, given that she lost the first three. But then Martin Schulz was always going to struggle to land a blow. It is tricky, for example, to attack Mrs Merkel's refugee policy when you are on record as having said that the faith in Europe that each migrant brought with them is worth more than gold. During the election campaign, Mr Schulz has focused on social justice; a subject to which he returned on Sunday night. He spoke about unemployment, poverty. Mrs Merkel batted both away. Five million people were unemployed when she began her first term - the figure is now at two and a half million. As for poverty, Mr Schulz's own party was responsible for the Harz IV welfare reforms that shape German social policy today. Under Mr Schulz's leadership, the social democrats are promising tax cuts. But Mrs Merkel's conservatives, who have a habit of stealing the best bits of a rival campaign, are offering similar breaks. Which left foreign policy. Mr Schulz was on bullish form. Donald Trump, he said, had brought the world to the brink of disaster several times with his tweets. It was time the world sought a solution to the North Korea crisis without President Trump, he said. And, as for Turkey, were he the German chancellor he would call off EU accession talks. Mr Schulz challenged Mrs Merkel to do just that. Mrs Merkel - who has never wanted Turkey to become an EU member - said she had ruled out that course of action for now. Nevertheless, she said, she would speak with other EU leaders to see whether they could develop a common position on ending the talks. Dramatic language, but Mrs Merkel could draw on years of crisis management. Her rather more measured language and approach appears to have appealed to viewers. Polls suggest they found her more believable and convincing. 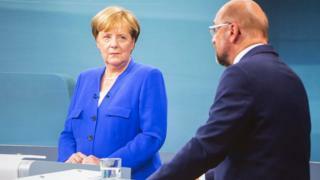 Before the TV duel, Mr Schulz said that he was confident his performance would sway undecided voters and create momentum. It is unlikely to be in the direction he intended.